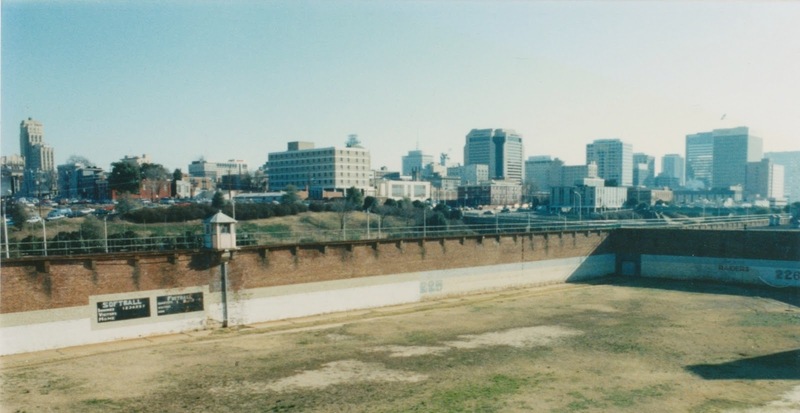 The Shockoe ExaminerBlogging the History of Richmond, Virginia: The Virginia Penitentiary in Richmond, January 1991. The Virginia Penitentiary in Richmond, January 1991. Rare view of Richmond from the old State Penn, 1991. 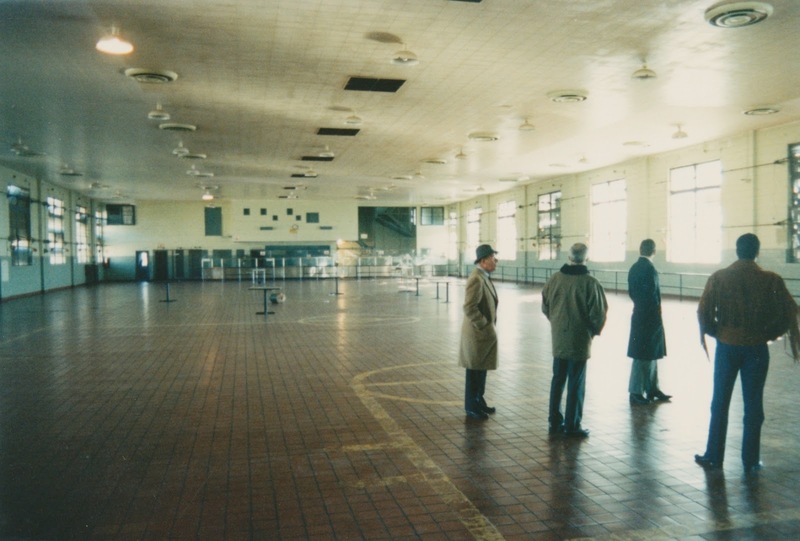 This entry by Selden Richardson includes rare color images of the interior of the Virginia Penitentiary in Richmond taken by Selden in late January 1991. Selden had taken part in a small tour of the Penitentiary weeks after its inmates had been moved to other state facilities. Nearly one year later the penitentiary buildings were demolished. 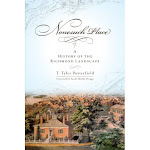 For a history of the penitentiary, view the guide to the Records of the Virginia Penitentiary, 1796-1991 (bulk 1906-1970) held at the Library of Virginia. 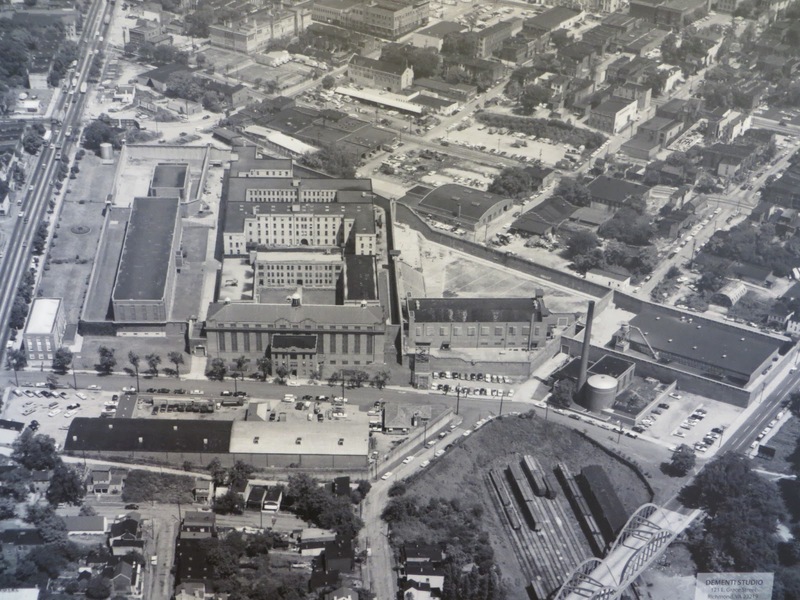 An arial view of the Virginia State Penitentiary complex located along Spring Street at the intersection of South Second Street. The site is now largely occupied by Afton Chemical, formerly known as Ethyl Labs. This view from the south shows the line of entire city blocks that were destroyed to create the Downtown Expressway which today runs parallel to West Canal and East Byrd streets. 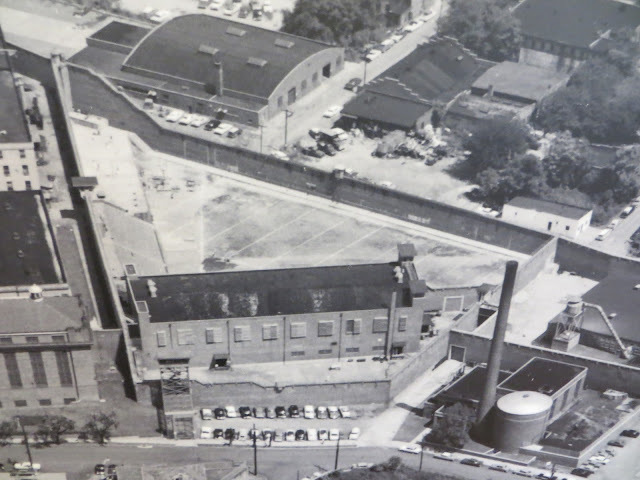 Within the grounds of the old Virginia State Penitentiary on Spring Street was a building with its own separate tall brick wall. This was the maximum security building, home to the worst of the worst. In the basement of that building was one corridor of cells like these, and this cold, gloomy steel world was about as low as you could go in society. 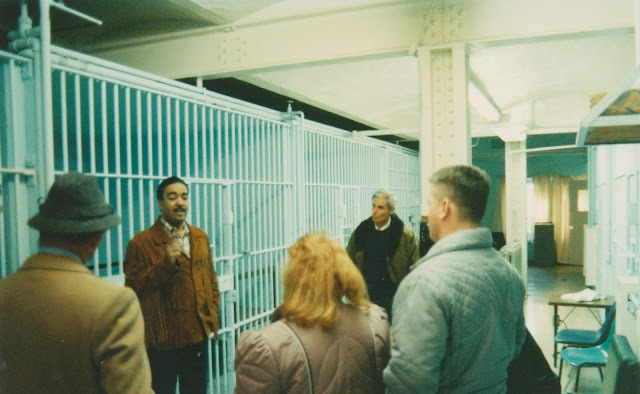 Today this building has been replaced by high-tech facilities like "Supermax" prisons, but for many years the most violent and vicious criminals in the entire State were held in this dungeon-like basement. A close-up view of the facility shows the prison yard and the walls of penitentiary shoehorned in beside the highway. 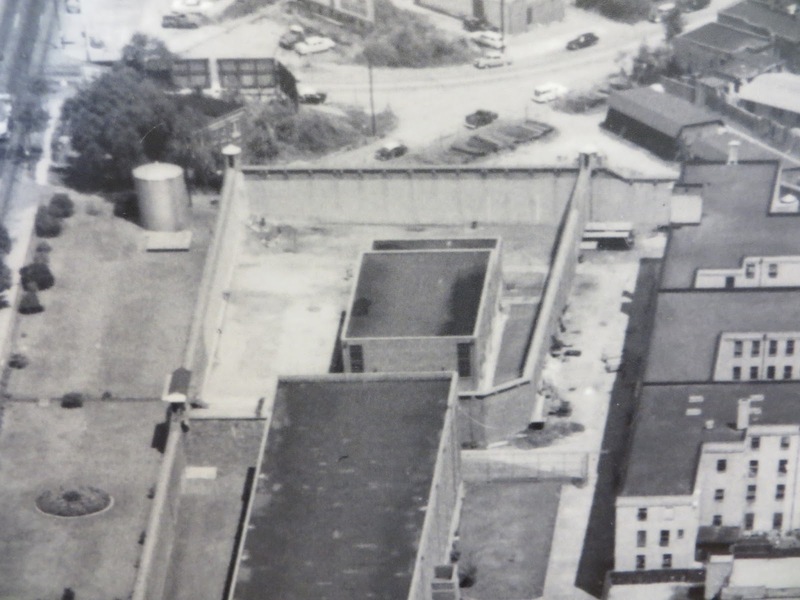 That prison yard also served as a ball field for inmates - see the image below. This is a view from inside the now-demolished Virginia State Penitentiary, looking northeast toward downtown Richmond. Although smaller than a regulation size baseball diamond, the field did allow recreation and bleachers for spectators inside the brick walls. - Jan. 1991. That same location in 2013 - some 22 years later. A Virginia State Penitentiary officer slumps in one of the recently-vacated tier areas of the Pen in 1991. 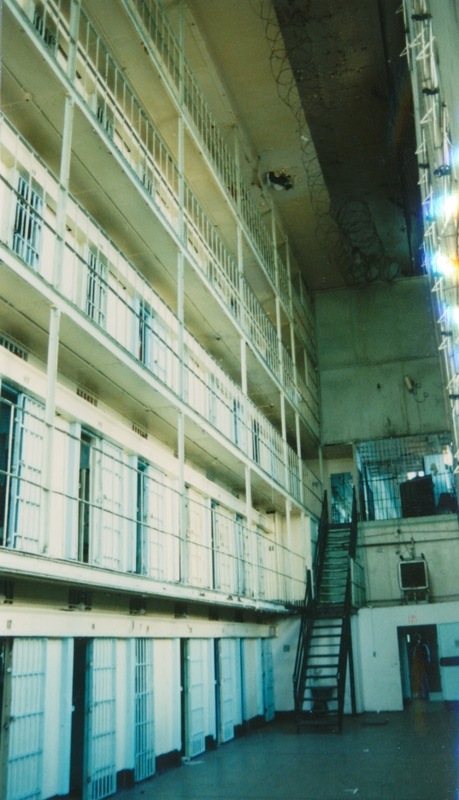 Between the time the inmates were moved to other institutions and the complete demolition of the building complex, it was open for tours. Stark, cold, and desolate, this rare window into the Pen afforded a rare opportunity to observe the architecture of confinement. The demolition of the Pen brought to a close almost 200 years of there being a penitentiary on this site. - Jan. 1991. 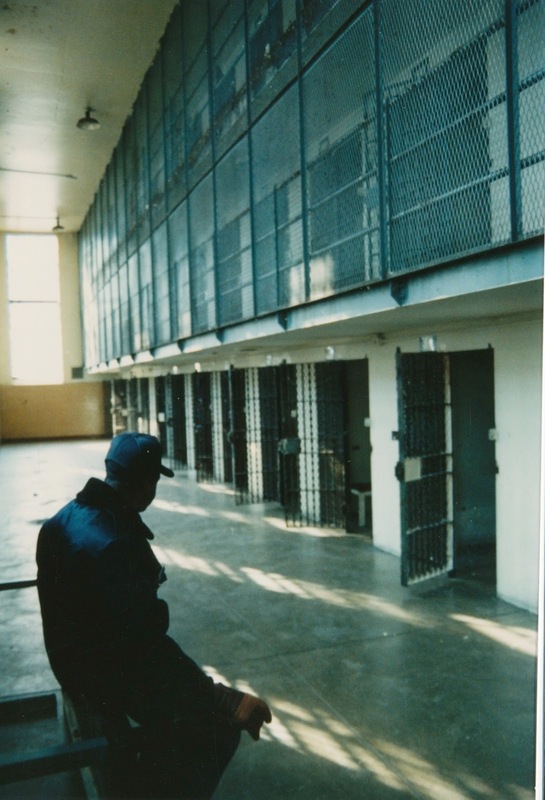 Although cold and quiet in this photograph, this area of the State Penitentiary must have been noisy and hellacious hot space in the summertime, filled with tier upon tier of inmates. Note the lack of electronic monitoring in the tier area and the crude security measure of stringing concertina wire to prevent access to the ceiling spaces. - Jan. 1991. This large space on the eastern side of the Virginia State Penitentiary was the mess hall, which served many meals to the inmates over the years. Here is the winter of 1991 the space was cold, empty and desolate where it had once rung with the shouts and cries of hundreds of men, some facing a lifetime of meals in this steel-bared cafeteria.- Jan. 1991. This prison cell is in the basement of the maximum security building. This dungeon-like area was the worst part of the penitentiary and home for inmates whom were at the rock bottom of society in Virginia. 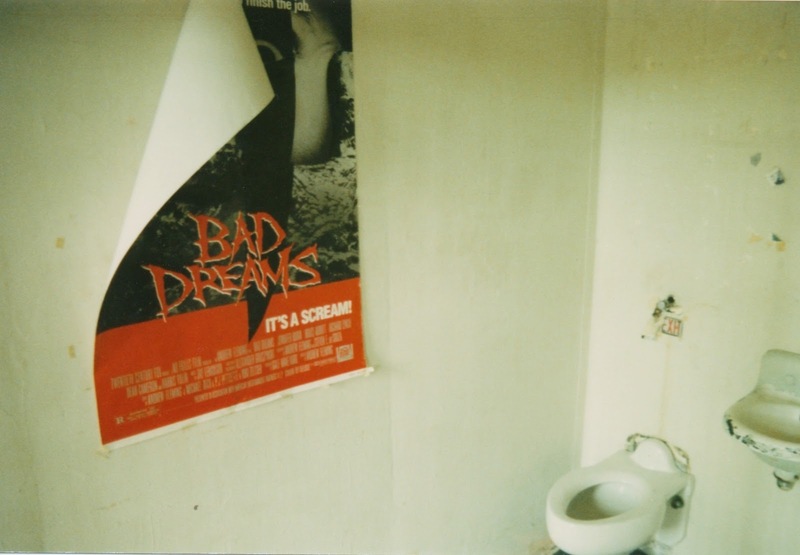 - Jan. 1991. 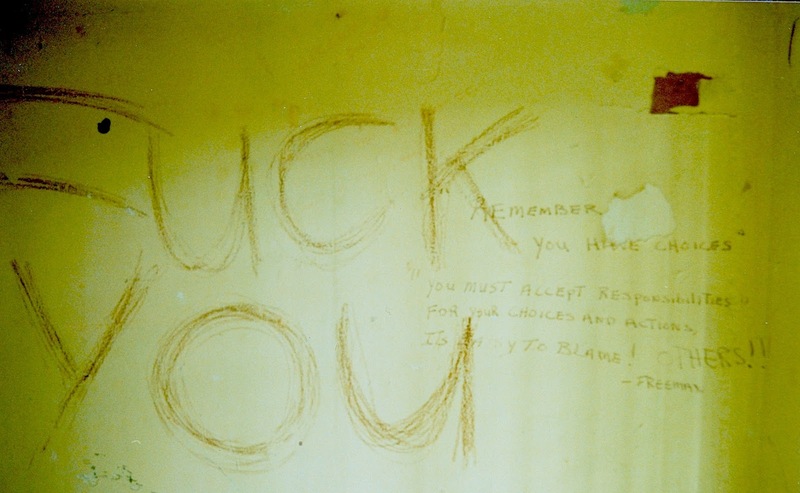 Mixed messages left in a cell from inmates who were told to pack their belongings and prepare to move from Richmond's old State Penitentiary. There are probably two hands at work here, the first leaving a homily about the choices one makes in life, the second inscription having none of it. - Jan. 1991. A Department of Corrections guide stands outside the small bank of cells that constituted Death Row in the old Virginia State Penitentiary. Only a few steps away, around the corner, was the room where the electric chair waited for the condemned. These cells were used for decades to hold some of Virginia's most violent and desperate criminals before they were electrocuted. - Jan. 1991. 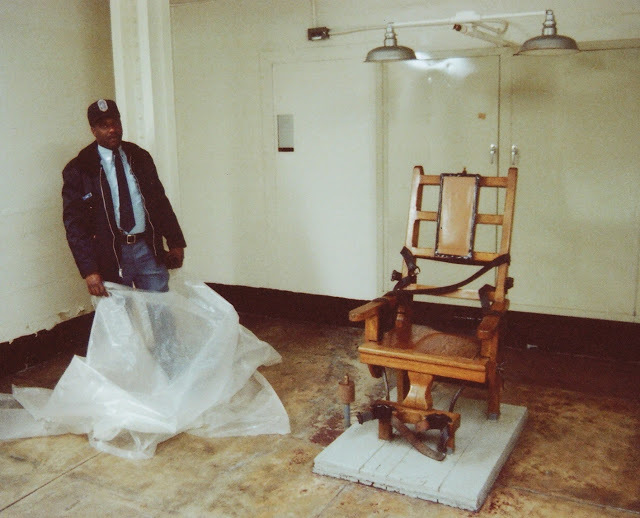 This is the Virginia electric chair, pictured in January 1991 shortly before the demolition of the Virginia State Penitentiary and moving the chair to Greensville Correctional Center in Jarrett. In the Commonwealth, the condemned has the choice of lethal injection or the electric chair. Electrocution in this 101-year-old chair was chosen as recently as January 16, 2013 by an inmate who distrusted the lethal injection method. - Jan. 1991. 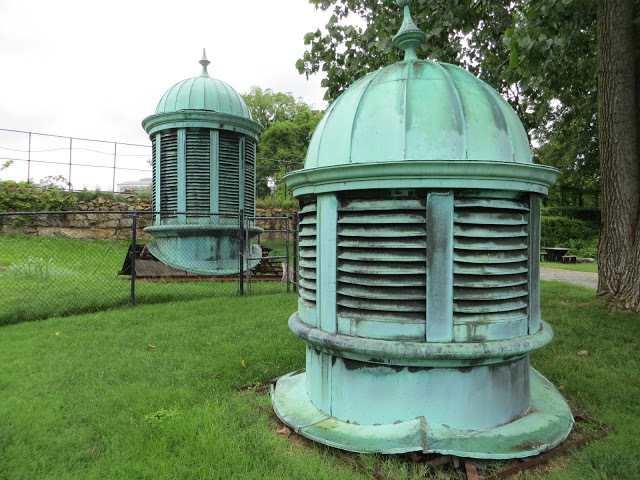 The three copper ventilators from the main Penitentiary building are perhaps the only architectural feature of the entire prison facility that still exist. For decades these vents conveyed the stench of sweat, blood and fear up from the main tier building. These conduits of misery are today a silent if inexplicable part of the exhibit at the Tredegar Ironworks historical site near the canal. - June, 2013. 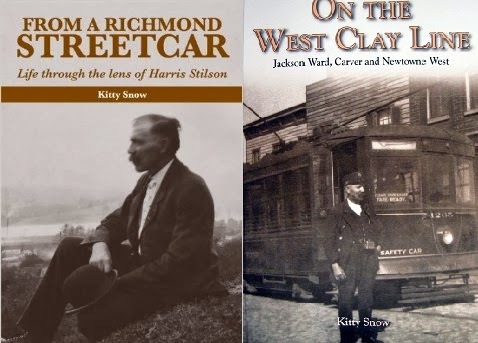 Posted by Shockoe Examiner Staff - see bottom of blog entry for the specific author. The site is largely owned by Afton Chemical, formerly known as Ethyl Labs, still owned by the Newmarket Corporation. Thanks - we'll put that in the text! My father worked for DOC for more than 20 years. I remember driving down 195 back in the '80s, and my dad pointing out the penitentiary. It always looked sinister. He applied for the warden position there in the early '80s, but didn't get it. 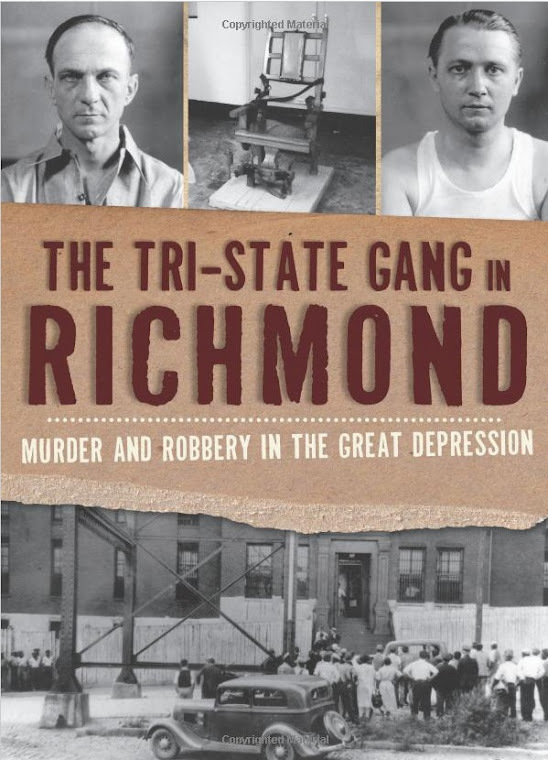 And before they built the DOC's current headquarters in South Richmond, he had a lot of meetings at the pen. I've also known a lot of guys who did time there in the '70s and '80s. They always call it "The Wall." That's what it was known as, because of the gigantic wall that surrounded it. I worked for Sovran Mortgage/NationsBanc Mortgage at 2nd & Cary from 1986 to 1992. It was always odd to sit at the light at 2nd & Byrd and look up to see an armed guard. We had quite the view of the prison from our 6th floor conference room. The 6th picture from the end is incorrectly identified. The maximum security unit (C building)had no cells with windows in the rear. In fact none of the cells in the Penitentiary were contructed in that manner. So if no cells in the penitentiary were built like that, then where is the photo from? I'm a little late in getting back to this comment, but I assure you the basement of that building is where this photo was taken. The window is not directly in the cell but there was a corridor or some kind of space between the actual cell and the outer window. Dont know if you are still reading this but the cell looks identical to a cell in the segregation unit at Powhatan Correctional Center. It was called D-tier and was located beneath the main seg unit. In the past it held death row inmates for a short time. Recently it held inmates from Deep Meadow when they were misbehaving now its just an empty corridor due to the prison closed this past year. Wow...I'm not from VA but my husband is and tonight after dinner we rode pass the Wall and I learned a lot. I had no idea there was such a place. Come to find out a guy we know mutually had did time in their. Wow! The cell in question is definitely one of the cells in the basement of "C" building. I was down there on many occasions as a member of a psychological program run by VA. TECH in the 1970's. 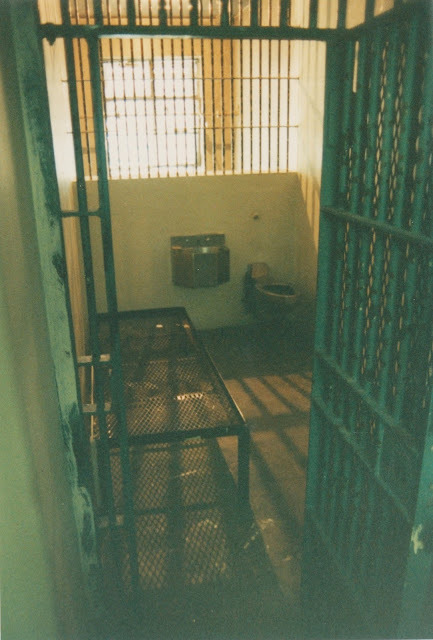 There was in fact a "dead area" between the cell and the window, sort of a "dry moat" if you will. It was no fun down there and hot as hell in the summer. I still remember my first time in the "Walls" It was a bright sunshiny day until we got through the "sallyport" and then my whole world changed. I could have sworn that it was a stormy day because it turned very gloomy, very quickly! I have never forgotten that feeling and that was in 1972. It should never have been torn down. 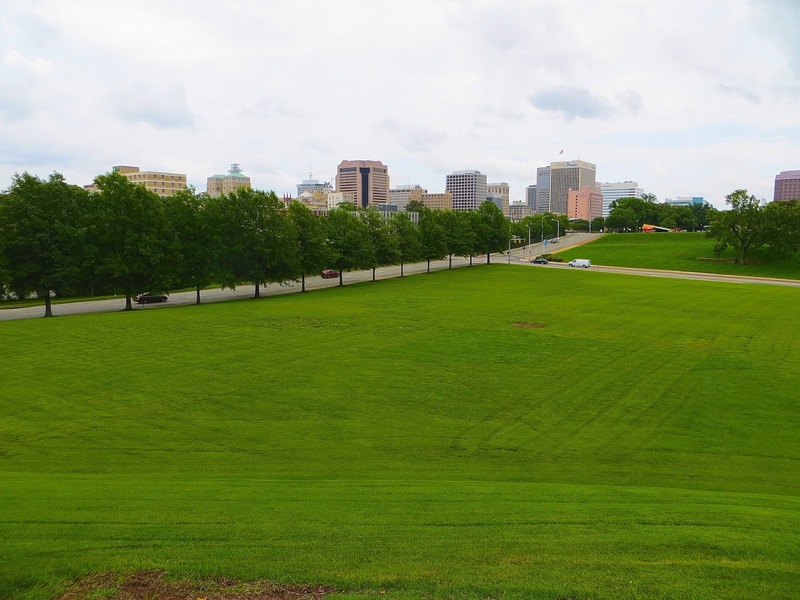 It could have been used for a lot of worthwhile programs for youthful offenders as well as a tourist attraction. Peoples curiosity is very morbid sometime. Ken A. My 4x Great Grandfather Martin Mims built the original part of this prison. I would have liked to tour that part before it had been demolished.